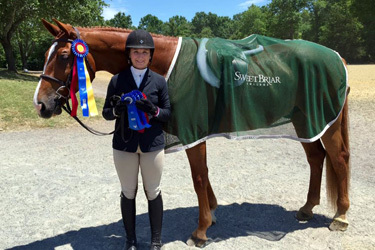 Sweet Briar riders compete successfully in local and rated shows off campus in the USHJA Zone 3 region. Qualified students who are not on a team may participate as independent competitors in off-campus activities. Students also enjoy foxhunting, hunter paces and hunter trials with area clubs, including Farmington, Deep Run, Oak Ridge and Bedford County hunts. The College hosts several prestigious riding competitions each year, including indoor shows, a hunter trial, hunter pace and the Sweet Briar Horse Show, an annual event since 1926. Less experienced competitors can also ride and compete outside of lessons — our in-house shows let them experience the thrill of competition and build confidence. Both advanced competitors and beginners enjoy a full calendar of riding activities throughout the year. Whether competing independently or on a team, participating as a recreational rider or working behind the scenes as an organizer, students at every level help make riding events a success.